Cesar Chavez Day #CesarChavezDay « Adafruit Industries – Makers, hackers, artists, designers and engineers! Cesar Chavez Day is a national commemorative holiday in the U.S. It is aimed at celebrating the birth and legacy of the civil rights and labor movement activist Cesar Chavez, on March 31. ‘Cesar Chavez (born César Estrada Chávez, locally: March 31, 1927 – April 23, 1993) was an American farm worker, labor leader and civil rights activist, who, with Dolores Huerta, co-founded the National Farm Workers Association (later the United Farm Workers union, UFW). The day is commemorated to promote service to the community in honor of Cesar Chavez’s life and work. Some state government offices, community colleges, libraries, and public schools are closed. Texas also recognizes the day, and it is an optional holiday in Arizona (official holiday in the city of Phoenix, Arizona) and Colorado. Although it is not a federal holiday, President Barack Obama proclaimed March 31 as Cesar Chavez Day in the United States, with Americans being urged to “observe this day with appropriate service, community, and educational programs to honor Cesar Chavez’s enduring legacy. Read more! 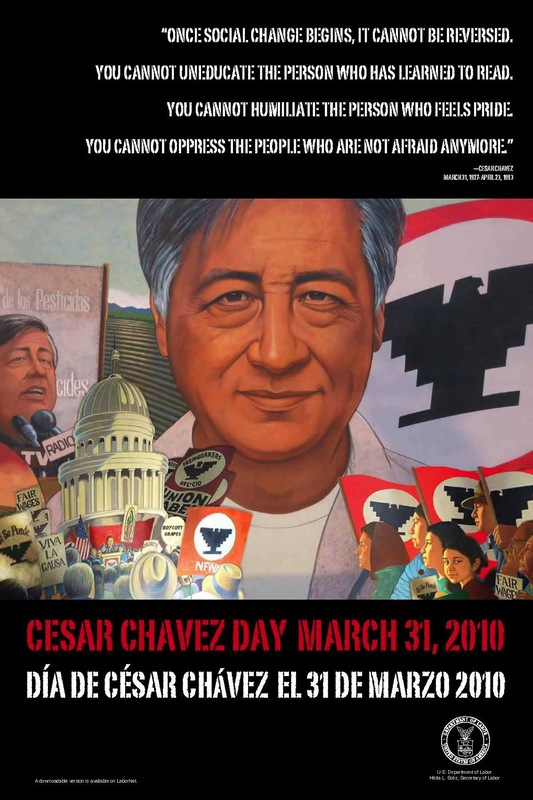 If you are in California and want to attend an event check out CesarChavezday.org for parades and more!